My two last buggys ware small and quick, so this time I wanted to build a big one. To get better control in long range I have used SBrick. The overall size is 50x30x21 studs (~40x24x17cm). The wheels used the ref no. 92912, from the Unimog set. To do it as fast as possible I have built it very simple and light, it only has 698 parts, and the weight is only 1.3 kgs. It is powered by 4XL motors, 2 for each axle with 1:3 final gear ratio. With so many motors it needs to use 2 batteries and 2 SBricks. The max speed is around 8kph (5 mph). I have used a special configuration for the motors to get the best possible preformance. With it the transmission is very simple and it only has 4 gears... and nothing more. Simple and effective. The suspension configuration is a double wishbone in both axles. It is every soft and with long travel, essential to go fast on bad terrain. 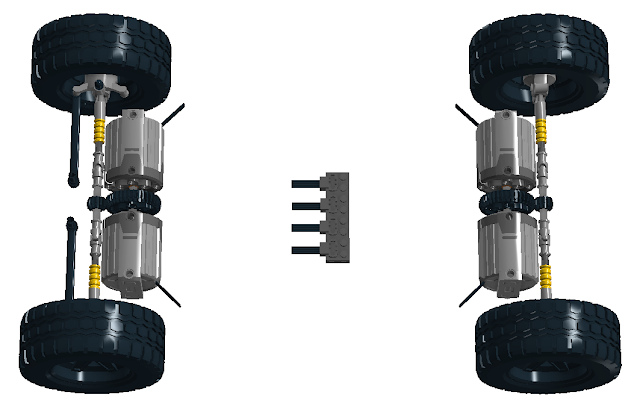 How about the durability of the driveline components (driveshafts, gears) when using that much power? Those bigger builds always concern me because they put quite some strain on some of the smaller components. Love your creations! I would be interested in knowing more about how you wired the 4 drive motors to the 2 sbricks. I also would be interested in know how you setup the sbrick profile that controls the buggy on a tablet. Maybe a future post could be about how you use the sbrick in your creations and how the profile is created that controls the creation. Thanks for your instructions, can't wait to try it out !! Very cool, the speed is awesome, it isn´t a problem not having a diferential when steering. Se pueden abrir las instrucciones con una tablet o debe de ser por ordenador? Debería ser posible pero no lo he intentado, ya que están en formato HTML. Okay. Thanks How do you connect the S brick to motors and battery box? Is it the same as Ir Receiver or not? It is like the IR receiver, but you need a extension PF wire to connect Sbrick to the battery. I also would like to know how you set up the sbrick configuration having 4 gears. Really good comment, thank you. The LDD doesn't have the Servo motor because when I published the instructions LDD doesn't include the servo part. You have discovered why I can't publish instructions for my big and really complex cars in LDD format... it is almost imposible to follow. Don't the wheels slide on the ground and make turning difficult? On one of my cars, it almost ruined the drivetrain. No, because this buggy has been designed to be used on low drag surfaces, like sand or little rocks. Hi will you be creating pdf instructions of this as well in the near future? Real cool buggy. Hey Sheepo, two question can you create a pdf construction? The LDD is very cool, but is not a step by step manual construction. I tried with 4 M Motors, it's also good, why didn't you build these with 4 M's? LDD can generate the instructions step by step like PDF ones, and step by step in 3D. I used 4XL because I wanted all power I could add, and XL motor has twice power than M motor. I went to the download folder on yuor google driev (as instructed above) and cannot see any instructions for this buggy - have you removed them because it is an older model? New Twitter and Instagram accounts!!! ©2016 Sheepo's Garage. Powered by Blogger.